Women need comfortable sandals for all kinds of situations, whether you are spending your days hiking, traveling, having a casual day out, or working in an office, what most women want is something that is going to look good and feel great to wear. We have rounded up some of the best designs that provide comfort, value, as well as style from some of the most popular luxury and fashion shoe brands. First up we have the Gia Sandal by Franco Sarto. This style is a beautiful option if you are looking for a flat design that is both comfy and classy. What is excellent about the Gia is the versatility of the design, you can wear them with almost anything including jeans and skirts. They aren’t the most feminine looking sandal in person, but they are pretty cute overall. They work well for walking long distances even in hot weather; your feet won’t sweat or slide out of the shoe as the back buckle helps to keep them in place. The Gia is also great for travel as they are easy to get on and off when going through airport security. Most women find they are comfortable enough to wear for long periods because of the cushioning and the decently thick sole. They also have a slight heel and a little bit of arch support. The Gia comes in some beautiful color options in either soft leather or suede; the color options range quite a bit depending on where you get them from. Overall the Gia is a very well made, classic, comfy style that is a fantastic option for the summer. Since Clarks is one of the most well-known comfort brands, they have a lot of different sandal styles to choose from. One of their most popular is the Leisa Annual Sandal. These are a classic, practical style that is very light and easy to walk in. They have a Velcro side strap, so you can make sure you get the right fit and that your heel won’t slip out of the shoe. The footbed is soft with a medium amount of support, and the outsole is quite flexible (you can bend it back and forth if you are holding the shoe). The Leisa isn’t as clunky as some Clark designs can be, I would say it is lighter and a bit more fashionable than many of their other options. The heel has a little bit of lift to it that will give you a tiny bit more height. 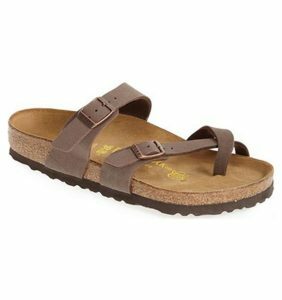 If you want a good quality, comfortable option that you can wear for walking, that is also pretty fashionable you will want to check out some of the Birkenstock styles. Most of the Birkenstock designs are relatively bulky, so if you are on the petite side, you may find them a little overwhelming if you have a small build. They are also somewhat broad, so they may not be the best option if you have narrow feet. If you are interested in Birkenstocks, the Birkenstock Mayari is one of their cuter, more feminine options. Mayari offers the usual, classic Birkenstock comfort and they come in a ton of different colors. They have a reasonable amount of arch support, but they usually need a few days to be broken in and molded to the shape of your foot. Once you do, they are an excellent summer shoe. The leather will stretch out a little bit, but that makes them more comfortable. Overall they are a great everyday sandal that works well for walking and traveling. Born shoes are renowned for their comfort, as well as their durability. 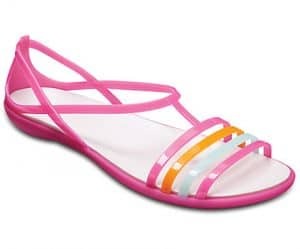 Many of their sandal styles are also pretty cute, a favorite for a lot of women is the Born Trang. It is stylish, very well made and is reasonably priced for the quality you are getting. Born shoes tend to hold up very well over multiple years of wear, remarkably the soles of Born’s shoes often barely show any wear and tear after lots of use. The Trang is a slightly different, flat style that has a lot of padding on the footbed. Apart from the cushioning the other feature that is the key to the Trang being super comfortable is the upper leather is unbelievably soft. The leather also means that this style can be worn with lots of different outfits. Unfortunately, the sizing is a little bit limited with Born; there are no half sizing, nor any narrow or wide widths. One of the more current comfort options that women are loving is the Toms Majorca Sandal. 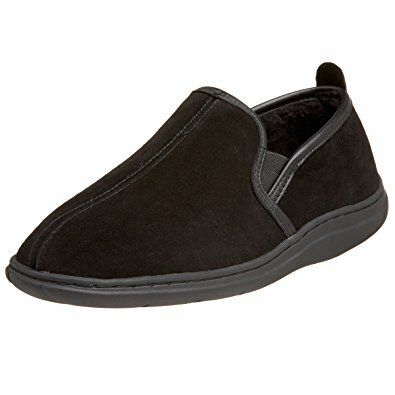 You will know Tom’s shoes from their ubiquitous classic slip-on style. The Majorca is comfy like other Toms styles, but it much more dressy and stylish. If you get the Majorca with the suede upper, they are incredibly soft, and you won’t need to break them in at all. The block heel is 3 inches, so it has a decent amount of height if you are looking for some lift while still being relatively easy to walk in. The padded insole also helps to make walking and standing in this shoe for long periods reasonably easy. This particular style goes with lots of different types of outfits including dressier workwear as well as casual looks. If you see the Majorca in a store try them out, I think you will be surprised at the comfort, especially for a heel. Munro is a much-loved comfort brand that is known for creating great fitting shoes that come in one of the best selections of sizing for all different types of feet. Their sizes range from 4 to 14 and AAAA to EE. 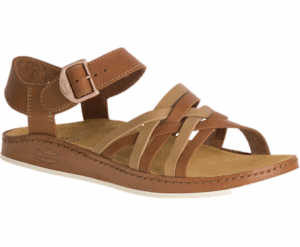 The Pisces’ is one of Munro’s most popular sandals. It is a beautiful style that has a classic two-strap design with the upper straps made of different materials including a leather upper with a suede and microfiber lining. Like a lot of the other designs on this list, they are easy to dress up or down. Munro’s shoes are also known for their fantastic support, the arch support on the Pisces’ is so good that a lot of women who have plantar fasciitis or other foot issues that often cause discomfort can wear this sandal as a dress sandal for fancy events. If you look hard enough, you will see the Irenee Ankle Strap Sandal from Steve Madden everywhere over the summer months, and with good reason. Not only is it unbelievably cute, but it is also unexpectedly very comfortable for a heel. Obviously, it is pretty hard to find a good heel that won’t cause you a lot of pain if you have to wear it for hours on end at a wedding or a formal function, but if you need a heel that has a modern look that won’t kill your feet, you should give it a try. The Irenee has a 2-inch block heel which doesn’t feel too high and is, for the most part, easy to walk in. To also help with walking there is an ankle strap that will help hold your feet in place. You can wear this style with casual as well as formal outfits, as they adjust well to both looks. You aren’t going to be walking super long distances in the Irenee, but if you need a heel and want to be comfortable, this is an excellent option to try out. 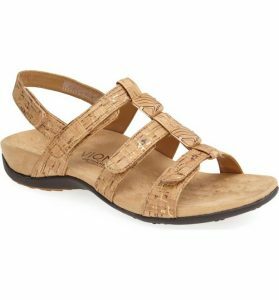 For those women who are fans of classic Chacos and who might be looking for something that can go with a broader array of outfits, you may be interested in one of the Chacos leather sandals. Devotees of Chacos love them for their excellent arch support which the Chacos Fallon definitely has. The Fallon also has super soft leather straps that are durable enough to be put through some heavy duty activity. These shoes are great to walk in and are easy to get on and off due to a little bit of elastic behind the buckle, which lets you slide these shoes on and off relatively quickly without having to unbuckle them. It is another style that would be a good choice for traveling in because it is good for walking, is a classic style and can be dressed up or down depending on the situation. People have pretty strong feelings about Crocs mostly due to the oversized clog style, but the company is so much more than the clogs. 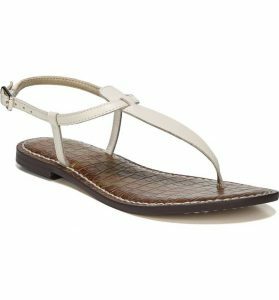 They have lots of other styles that are well loved for their comfort including the Crocs Isabella Sandal. The Isabella is very similar to the jelly shoes of the 1980s (remember them? ), although with softer and more durable rubber. Since they are so comfortable they can be worn as an everyday shoe; some people even wear them to work. They have enough support to be worn for walking a reasonably long distance, or you can wear them to the beach. One key feature of Isabella that is worth noting is that they are super easy to wash since they are rubber, so you can get them as wet or dirty as you want and they will clean up and look as good as new. These are also an excellent style to consider taking when traveling because they are light and they’re slip on and off quickly when going through security. Overall people love these shoes because they look good, feel good, are made well, and are durable. 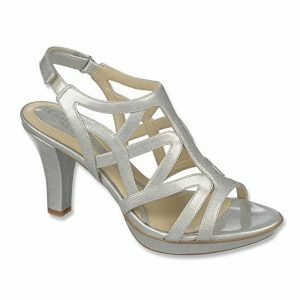 Naturalizer has a good selection of dress and flat sandals that are both known for the quality and comfort that are offered. 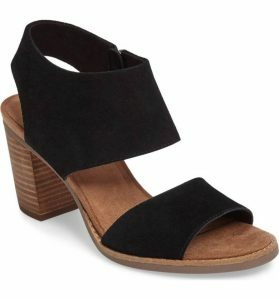 One of their standout dress sandals is the Naturalizer Danya Dress Sandal. Despite its 3.5 inch heel and .75 inch platform, this sandal manages to maintain it’s comfort incredibly well for a heel. The footbed has well-placed padding with enhanced arch support, as well as a very flexible outsole that is non-slip and lightweight. It has a sturdy Velcro strap at the heel that helps to make them surprisingly easy to walk in. The Danya is well worth checking out if you are looking for a dress sandal. 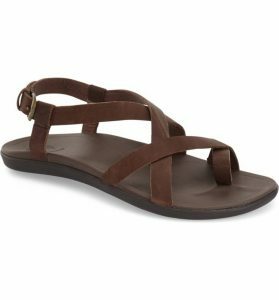 A beautiful, casual sandal that is an excellent option for those with plantar fasciitis or if you have heel or knee pain is the Vionic® Amber sandal. It has three hook-and-loop closures at the heel, instep, and forefoot that will give you a lot of control over the fit. If you aren’t sold on the style, you can remove the vertical strap with the embellished, and it will convert into a simple three strap sandal. Depending on the color option you choose, the upper is either leather or synthetic. It has a microfiber insole, flexible EVA midsole, and a rubber outsole. There are a slight 1-inch heel and a back strap for positioning. Some reviewers have mentioned an issue with the back strap coming undone too frequently when walking. 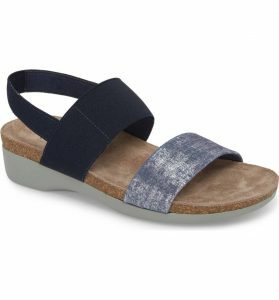 If you like OluKai flip flops, you should be aware that there is a slightly dressier style from this brand in a sandal called the Olukai Upena’ Flat Sandal. 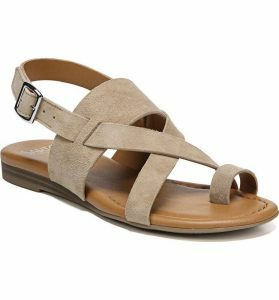 It is a minimal, multi-strap sandal that is made of good quality, soft leather that may work well as a travel shoe for some women. The Upena has an anatomically molded midsole with an average amount of arch support but which is nice and thick and that has a rubbery feel to it. It also has an adjustable ankle strap with a metal buckle for a customized fit. The leather will stretch a little bit, so you need to be careful with sizing. The Upena is a beautiful style that is pretty durable with a simple yet stylish look. 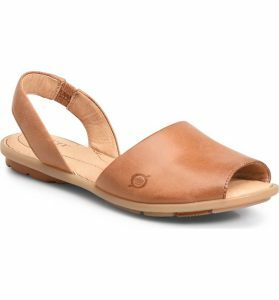 If you are on a budget and want a leather looking comfort sandals without having to spend a lot of money, have a look at the B.O.C Kesia. The faux leather looking straps are a polyurethane that most wearers find to be perfectly comfortable. The Kesia has an adjustable buckle to ensure the fit is good for your needs. The outsole is also a very light rubber with a good amount of cushioning on the footbed. Since it is a simple strappy style, you can wear them with shorts, pants or a casual dress. They’re inexpensive and are very durable. Most women who own this shoe feel that they are pretty high quality for the price you are paying. They may take a couple of days of wearing to break in. I wanted to make sure I included at least one athletic sandal in this post; the obvious one to choose is the Teva Women’s Tirra Athletic Sandal. These are one of the most popular athletic designs going for a few different reasons. Depending on your aesthetic, you can wear this style with some dresses or possibly to work (depending on what your work dress code is). 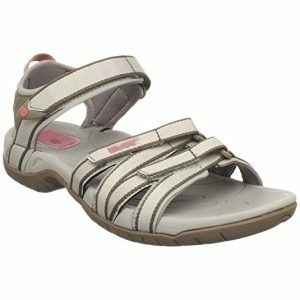 Most women find them to be extraordinarily comfortable because of the Teva footbed and the ability to adjust the shoe with the three customizable Velcro straps. They are designed to be able to get wet, so you can wear them for all kinds of summer activities without the fear of them being ruined if they are exposed to water. If you want a more minimal, flat bottom option that is still comfortable have a look at the Sam Edelman Gigi Sandal. The Gigi is a trendy design that can be dressed up or down, that is available all over the place. It is a very elegant sandal, but I’d only recommend this shoe if you love this style and are looking for a comfortable version of it. The midsole has a little bit of padding, but not a ton, and the outsole is also very thin, which means it is light, but it doesn’t have the shock absorption that a thicker sole would have. The Gigi isn’t a comfort style, but more a fashion style that a lot of women find comfortable to wear. Be aware that the sizing is a bit off with the Gigi, so you may want to consider going up half a size if you are interested in it. 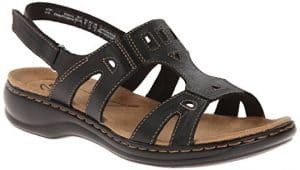 One other thing to note about the Gigi is this isn’t the most durable sandal, you don’t want this style for a walking trip in Europe, but they do work well as a somewhat comfy, stylish sandal.